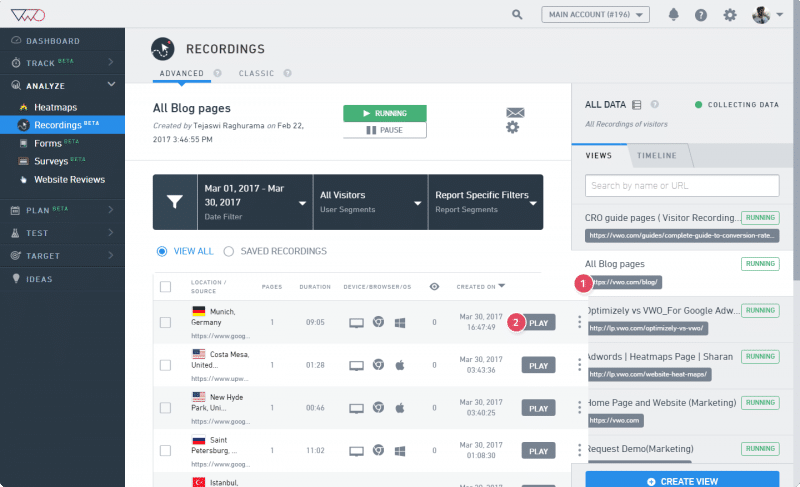 VWO Visitor Recordings allows you to record visitor interactions with your website in a video form. 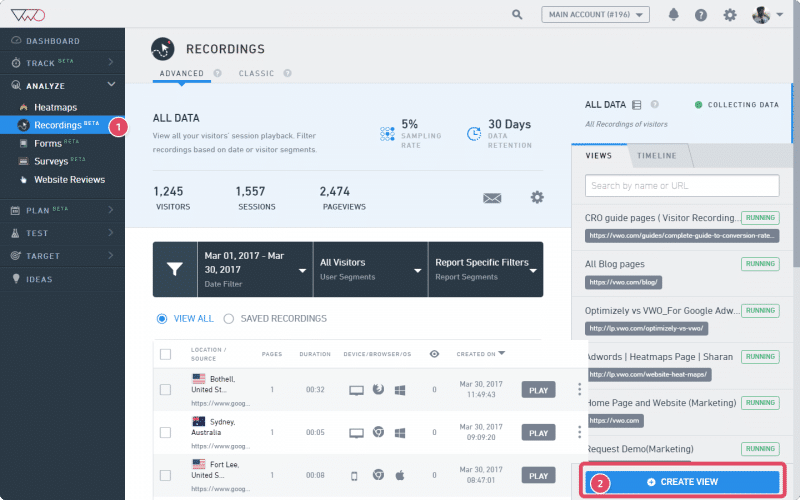 The Recordings dashboard is where you manage all the visitor recordings. To access the Visitor Recordings dashboard, click Recording under Analyze on the navigation bar. To view the recordings that you created in the older interface, click the Classic tab on the screen. On your first login to the Recordings dashboard, the Enable button would appear. Click it to enable recordings. After you have set up your recording page, click Start Data Collection to collect data for your website. 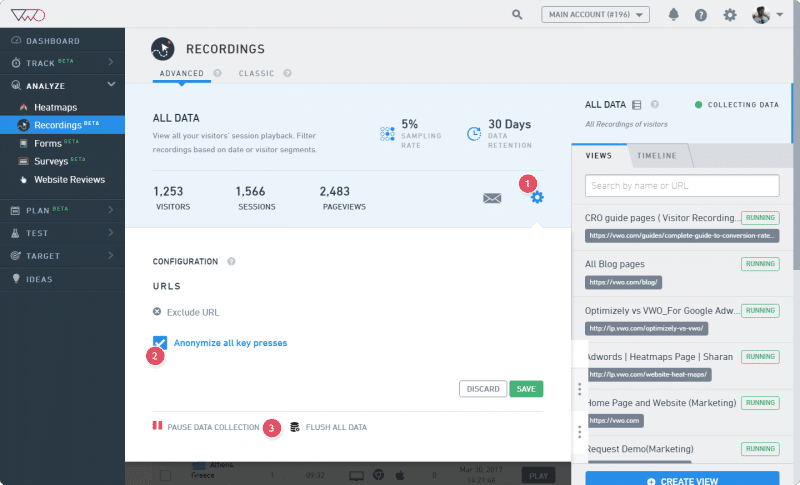 Based on the VWO plan you have subscribed to, the dashboard will show the total number of visitors, clicks, sampling rate, and data retention on the dashboard. If you have not yet started collecting data for a recording, select the recording from the Views tab on the right, and then click the Start button to start recording. If it’s already running, the button is labelled Running. To mail the Recordings report link to an email contact, click the Message icon. To modify the test you have just created, click the Settings icon. By default, VWO collects data on all the pages which have the smart code installed. But if you want to exclude certain URLs, you can use the Excluded URLs option. Click Pause Data Collection or Flush All Data to pause or flush the data. ATTENTION If you flush data or pause a test, data collection will stop for all the views you have created. If you don’t want to record key presses, select Anonymize all key presses. When you opt to anonymize key presses, VWO will ignore all input fields and will not store or transmit data. PRO-TIP You can also anonymize non-input fields by adding the “nls_protected” class to any html tag. To know more about anonymizing specific fields or inputs, click here. You can create customized views to track activities of a specific visitor segment and save the view for viewing later. To create a new view, click Create View. To learn more on Views and how to create them, click here. Click Play/Viewed to view the recording. Please note that the Play button is labelled Viewed for the recordings you have already viewed once. You can sort recordings in the order of source, device, browsers, devices, OS, and so on. You can delete and save or download Visitor Recordings per the plan you have subscribed to. Just click the ellipses against the recording you want to perform an action on. Clicking the Save option to save your recordings. ATTENTION If you annotate a recording with an observation, it gets saved automatically. When you click Download, the recording gets downloaded as a zip file. To view the recording, unzip the file and then open the index.html file. There are different filters available to filter your recordings. 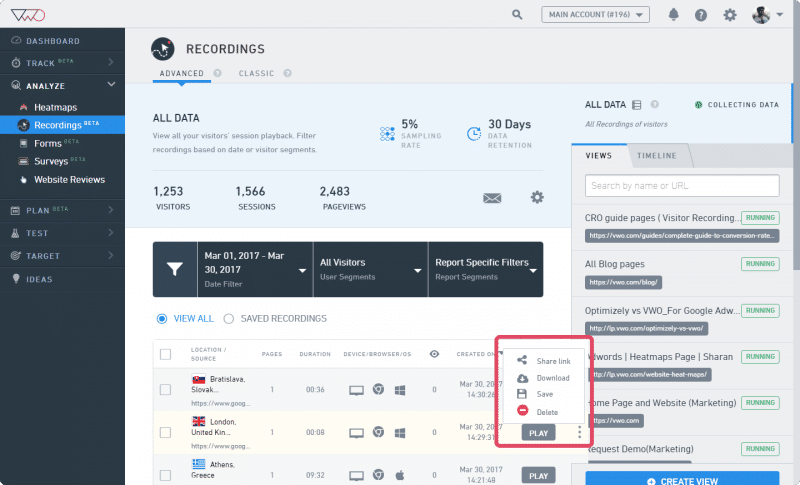 Using the filters, you can search visitor recordings by creating your own navigation funnel. To learn more on using filters, click here. Why does the CSS of my website look broken in the recordings player? When does VWO stop recording visitor movements? How long before visitor movements start getting recorded? How to record all pages of a website?